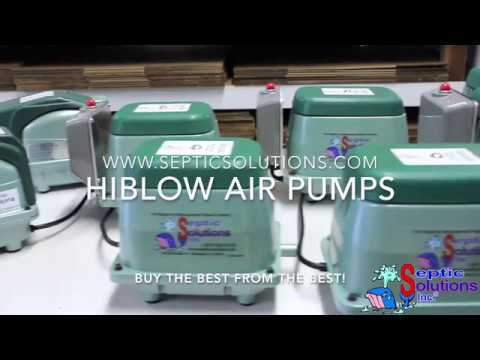 Hiblow HP-80 Refurbished linear septic air pump. This pump was refurbished by an experienced Septic Solutions® repair technician. Our team replaces the diaphragms, heads with air valves, air filter, and any other necessary parts to make the unit operate at factory specificaitons. The Hiblow HP-80 is a compatible replacement for the Gast SPP-80, Thomas 5078S, Medo LA-80, Secoh EL-80-15, and many other 80 LPM units. This refurbished air pump comes with a One Year Warranty as part of our Whale of a Deal program.